It was a success! With only two days in the Duluth area, we didn't have time for a snowstorm with whiteout conditions; unfortunately we had to deal with it anyway. As you can imagine, we didn't see any birds during the snow as we could barely see the road. We had an entire morning before the snow started but we just couldn't pull out a Boreal Owl. After battling the snowstorm in the afternoon we decided to just call it a day and hope the next would be better. 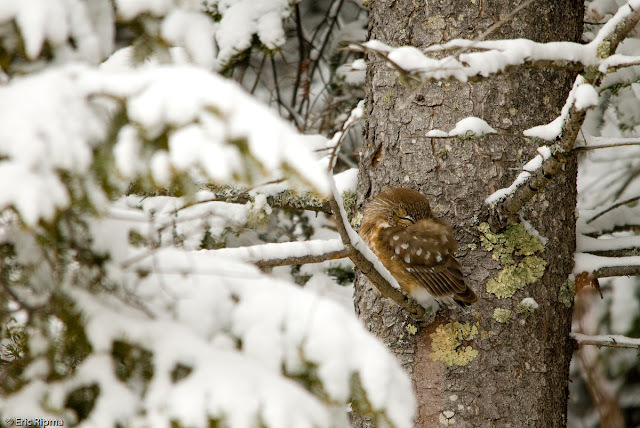 We started the next day at the famed, Sax-Zim Bog (there will be a post later about birding here) where we had some great birds but since we were really after Boreal Owls we left in the early afternoon to continue our search along the north shore of Lake Superior. We arrived at Alseth Road in the middle of the afternoon to find a group of birders along Scenic Route 61. They said that the Boreal had just flown across the road. 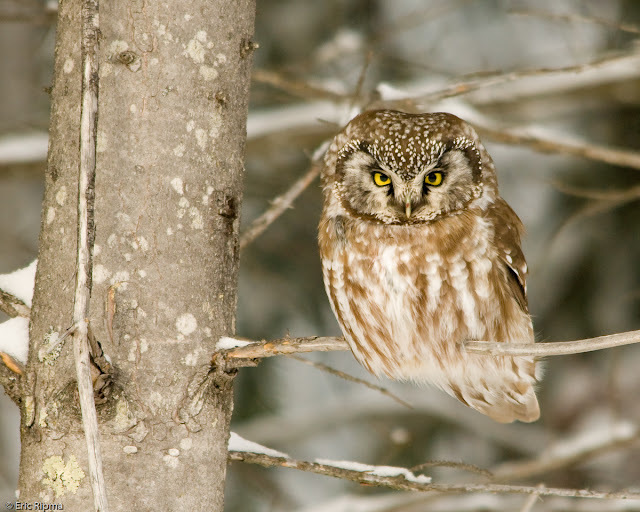 One of the guys pointed out a Northern Saw-whet Owl, when another birder said "Isn't that the Boreal"; turns out we were looking at different owls, the Saw-whet and the Boreal were within 30 feet of each other! What lovely images. I particularly like how the owls plumage in the first photo, drapes across the branch. Very pretty captures and scenes. I noticed the same thing about the owls plumage draped over its feet . . .I'm sure it helps keep the little guy warm!